Don and I went grocery shopping early this morning. I had been up for about an hour, had a mug of tea with almond milk, a homemade muffin, and edited a chapter of Cousin Ray’s book. That was not enough breakfast to sustain me through two weeks worth of grocery shopping. When we finally returned and unloaded the groceries I was way past starved. I just grabbed the most (&least) likely looking leftovers and threw them in the blender. It turned out to be surprisingly tasty as well as very satisfying and nutritious. It actually took me through an hour of weeding flower beds before I needed lunch. So I wrote down the ingredients and will be making it later on this summer with other fruits in season. 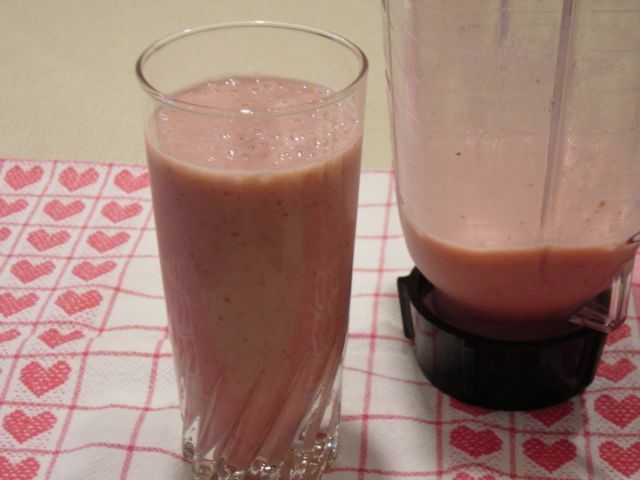 Wash the strawberries, trim, cut in half, and drop them into your blender jar. Add the chickpeas, almond milk, coconut (or almond) extract, and the amount of sweetener you usually use for 16 ounces of liquid. Turn on the blender. Give it a couple of minutes. Get out a glass, turn off the blender and serve it up. This mix was a surprise – chickpeas not only added nutrients and smooth texture it is amazing how long it kept me feeling full. After spending many hours cleaning flower beds today I had another smoothie about 1:00 – and didn’t even feel very hungry at dinnertime.